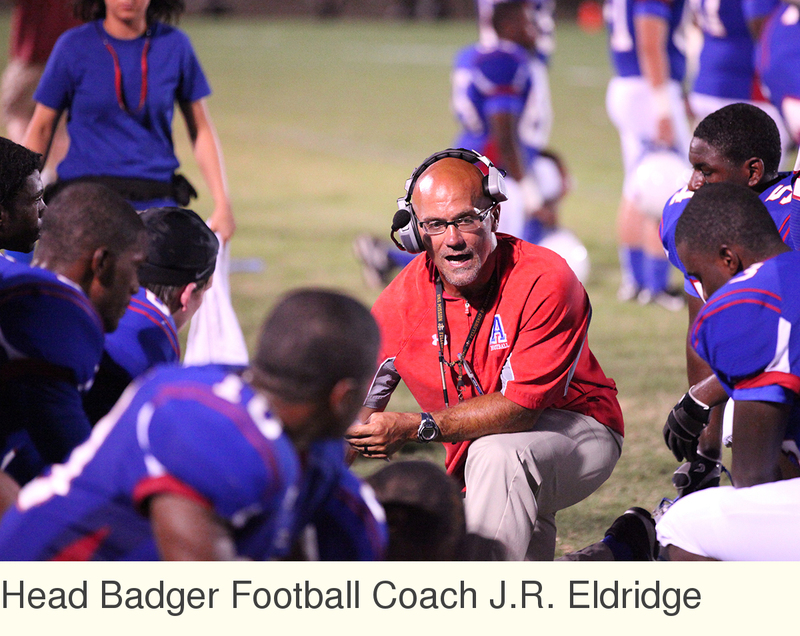 The 2012 Badger football team capped their 9-2 season with a 7-4A Conference title and Head Coach J.R. Eldridge, in only his second season as a head high school football coach, earned the recognition of Conference Coach of the Year. Vicious. Violent. Relentless. According to Eldridge, these are the words that drive not only the Badger football program, but also the daily lives of anyone who buys into the philosophy. Vicious. Violent. Relentless. According to Eldridge, these are the words that drive not only the Badger football program, but also the daily lives of anyone who buys into the philosophy. The slogan caught on and before long was on posters, windows of local businesses, and was being chanted from the stands at games. It is even being used as a Twitter hashtag. Football is a physical, contact sport. The design of the game mimics warfare and is built largely upon opponents striking each other with their bodies hundreds of times a game. And with that said, the VVR philosophy can be easily misunderstood, but Eldridge offered a denotative explanation for the slogan and encouraged everyone to put it to use in their daily lives. The VVR philosophy builds upon the three words’ literal definitions, and flows in order to describe the Badgers’: 1. Intentions (vicious), 2.Actions (violent), 3. Determination (relentless). Eldridge added that scripture includes instructions for followers who wish to take hold of the Kingdom of Heaven to do so violently. Eldridge insists that the negative connotations of the word ‘violent’ must be put aside to fully appreciate the message. ‘Relentless’ describes the Badger’s determination, especially in the wake of a tough end to the 2012 season. The VVR message will carry the team through the offseason as they prepare for next year. “Pursuit of VVR is intangible. We can’t touch that. This far exceeds a tangible goal such a conference or state championship. Those are things we can attain, we can hold that trophy, we can touch it. VVR comes down to how we are living our lives." In just two seasons as a head high school coach, Eldridge and his staff are doing things with the Badger football program that haven’t happened in years. Seven of the last nine seasons ended with a sub-.500 record; however, in 2012 the Badgers earned their first Conference Championship in over 15 years and finished with a 9-2 record. The community took note their success after the Badgers defeated Benton in the Kickoff Classic at War Memorial Stadium in the season opener and support continued to grow. “To me, the community buying into our message is awesome,” Eldridge said. “The community being involved now is a testament to how much our players believe in this philosophy. The message has led to success. It’s led us to a conference championship. It is leading us to great accomplishments. But what is even more awesome is seeing our kids grow up to become responsible, effective, productive individuals in all that they pursue. We are doing more than coaching a successful football team, we are preparing students for life. Badger Football is one of many first-class extracurricular activities offered by the Arkadelphia Public Schools, Clark County, Arkansas - Home of the Arkadelphia Promise.